The OpsMgr Connector could not connect to MSOMHSvc/hostname.local because mutual authentication failed. Verify the SPN is properly registered on the server and that, if the server is in a separate domain, there is a full-trust relationship between the two domains. Failed to initialize security context for target MSOMHSvc/hostname.local. The error returned is 0x80090303 (The specified target is unknown or unreachable). This error can apply to either the Kerberos or the SChannel package. my setup: certificate based authentication for servers in workgroup. 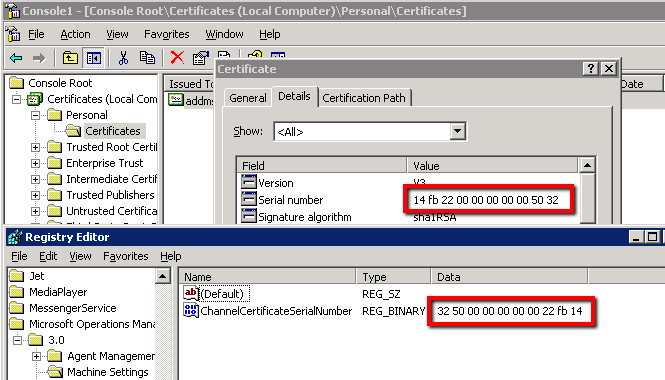 problem identified: MOMCertImport tool wrote the wrong certificate serial number to the registry so the wrong certificate was used for authentication. !!! the certificate serial number is wrote in the registry in reverse order.!! !